AOC is aiming looking to appeal to gamers, movie enthusiasts and professionals with two new 28-inch monitors outed in the budget category. The m2870Vhe and m2870Vq offer Full-HD resolutions and feature MVA panels, a 16:9 aspect ratio and a high contrast of 3000:1. They have a 5ms response time, making them perfectly suitable for gaming and are also LED-backlit. The m2870Vhe has been outed for £179.99 ($300, AU$325), while the m2870Vq creeps up to £189.99 ($320, AU$345). Both come with a three-year warranty. If you're wondering what the different is between the models, it's fairly simple. The m2870Vq has stereo speakers and an extra DisplayPort connector, answering the golden question of what an extra tenner can get you these days. 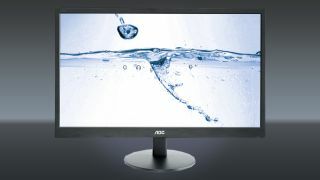 The monitors boast high colour fidelity, even when viewed at wide viewing angles of up to 178 degrees, according to AOC. They come with a luminosity of 300 cd/m squared, which apparently makes for crystal clear images when shrouded in bright ambient light. Connectivity-wise, the monitors feature D-Sub, DVI and HDMI ports, an i-Menu to access and change settings via the mouse, and Screen+ software to divide the display into four individual panes through keyboard shortcuts. For the environmentally-minded, there are e-Saver and Eco Mode options for decreasing power consumption. Both models have TCO 6.0 and Energy Star 6.0 certification. How well did the PC monitor market do in Q4?